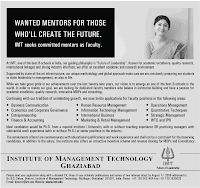 IMT Ghaziabad, one of the top ten B-Schools in India, is known for academic excellence, quality research, international linkages and strong industry interface. It offers an excellent academic and research environment backed with state of art infrastructure. Starting salary and position are dependent on qualification, research contribution, academic & professional achievements and experience. In addition to salary, an attractive incentive scheme is available for Research, Consulting and MDPs. Applicants from academia should have Ph.D. from reputed Indian / Foreign Institutes / Universities.